Captcha-verification.systems and its subdomains (v1.captcha-verification.systems, v2.captcha-verification.systems, v3.captcha-verification.systems, v4.captcha-verification.systems, v5.captcha-verification.systems, etc.) may appear on your browser from time to time prompting you to allow notifications from that site. If you do that, then notifications from Captcha-verification.systems will start spamming you with fake browser update notices (for example, “Please install new 77.33.42 upgrade”). If you download and run the offered “Update” file, that will most likely bring more malware or adware onto your PC. These notifications may be hard to get rid of on Chrome browser as the adware might change Chrome’s Group Policy to make notifications “enforced by administrator”. 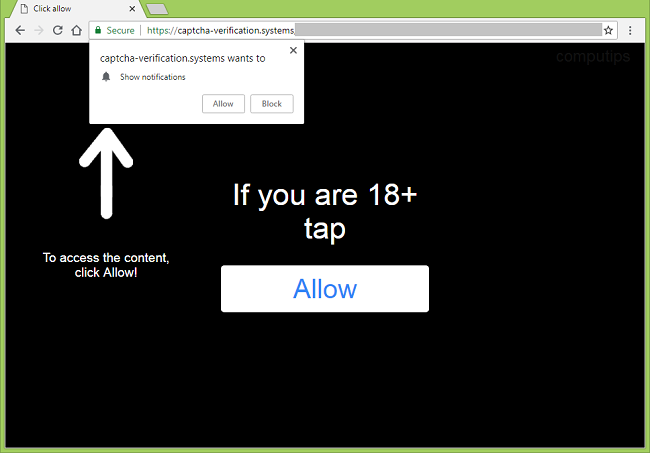 This step-by-step guide will help you to uninstall the adware and remove Captcha-verifications.systems pop-ups and notifications. The easiest method to stop Captcha-verification.systems ads is to run an anti-malware program capable of detecting adware in general and Captcha-verification.systems in particular. You may try SpyHunter by Enigma Software; it has excellent detection rate when it comes to adware and other PUPs (potentially unwanted programs). You can also try to remove Captcha-verification.systems by hand using the following instructions. Go to Programs and Features, uninstall Native Desktop Media Service program if you have it. Uninstall also suspicious programs, programs you don’t remember installing, or programs you installed just before Captcha-verification.systems appeared on your browser for the first time. When you are not sure if a program is safe, look for the answer on the Internet.